Der Nord-Westliche Teil von Frankreich. 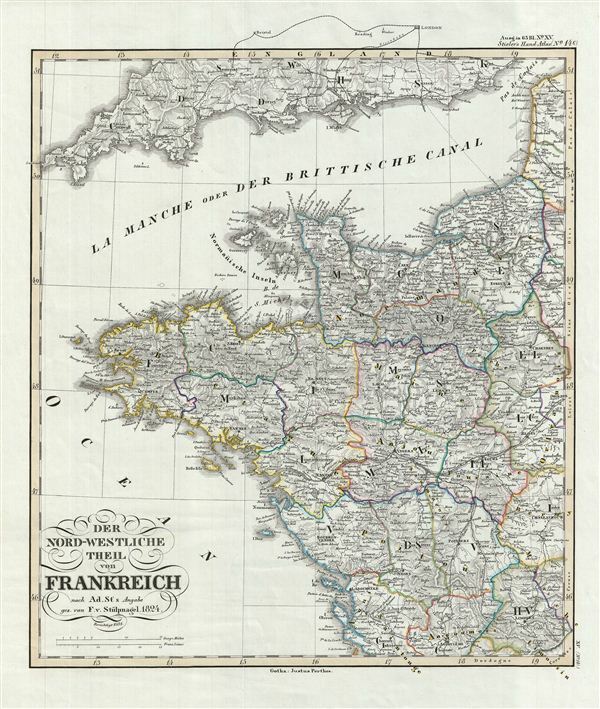 This is a fascinating example of the 1854 Justus Perthes map of northwestern France. It covers from Seine Infer to Charente in the South and west as far as Finisterre, including parts of neighboring england. Map is highly detailed with both political and physical data. Various cities, mountains, roads, rivers and an assortment of additional topographical details are noted. Political and regional borders are highlighted in outline color. Unlike other cartographic publishers of the period, the Justus Perthes firm did not transition to lithographic printing techniques. Instead, all of their maps are copper plate engravings and hence offer a level of character and depth of detail that was impossible to find in lithography or wax-process engraving. All text is in German. Issued as plate no. 14c in the 1854 edition of Stieler's Hand-Atlas. Adolf Stieler (1775–1836) was a German cartographer who worked most of his life in the Justus Perthes Geographical Institute in Gotha. His atlases are deservedly held in high esteem for their excellence. His Handatlas was the leading German world atlas until the middle of the 20th century, parts of which were printed until 1944. Stieler, A., Stieler's Hand-Atlas (Germany: Perthes) 1854. Very good. Some wear on original centerfold. Original platemark visible. Blank on verso.